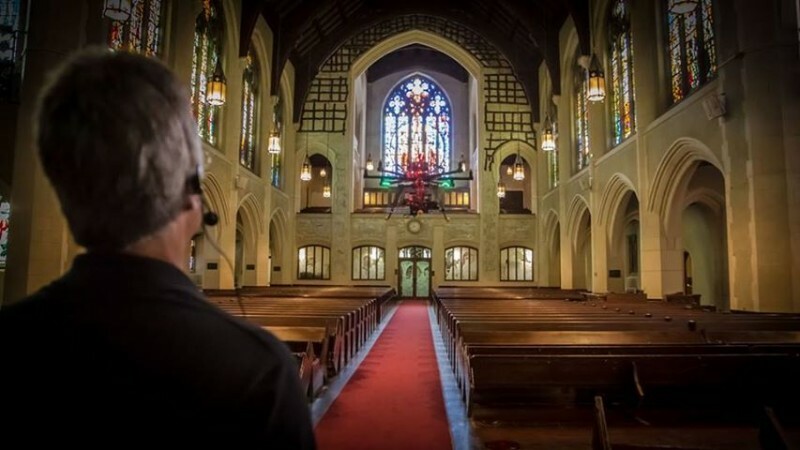 Recently we flew a RED Epic camera inside a church for a Sony produced feature film. The church was beautiful and it was certainly a unique experience to fly in it. But the shot did have its challenges and required precision flying and working closely with the Director and DOP to get it just right. The shot required a focus pull. And, of course, that meant we had to mount follow-focus equipment and live HD video transmission (Paralinx arrow) onto our RC multirotor. And to execute the shot required very careful coordination between Pilot, Camera Operator, Focus Pull Operator and Safety Spotters. After several flights exploring different variations of the shot for the Director, we delivered and the crew was very happy with the results. The Red Epic’s large dynamic range produced incredible results inside the church and we are looking forward to seeing the final product on the big screen!